The Pandan Leaf comes from the Screwpine tree, which can be found in Madagascar, Southeast Asia, the Pacific Islands including Hawaii, and the tropical areas of Australia. The fragrant leaf is tied in a knot and used to flavor dessert and cakes. In cooking, the leaf is used in making grass green Pandan cake, which is similar to the American sponge cake. Pandan Leaf is also used in rice and making different type of curries. Here is my recipe for Pandan Chiffon Cake. I hope you enjoy it. If using cake flour for this cake (not self-rising cake flour), add the baking powder and salt to the flour. If using self-rising flour for this cake, DO NOT add the baking powder or salt to the flour as self-rising flour already contains baking powder and salt in it. 1). Preheat oven to 350 degrees F (180 degrees C). 2). In a small bowl, combine coconut milk , pandan extract and ovalette (using ovalette is optional). Add the 1/4 tsp. of pandan paste (or 1/4 tsp. green food coloring) to mixture if using (using the pandan paste or green food coloring is optional). Set aside. 3). With an electric mixer OR by hand, beat the egg yolks, sugar, vegetable oil and vanilla until well combined. Beat in coconut milk/pandan extract mixture. 4). Combine flour, baking powder and salt (If using cake flour). *Note: Do not add baking powder or salt if you are using self-rising flour as self-rising flour already has baking powder and salt in it. Sift the self-rising flour (or cake flour, baking powder and salt mixture, if using) three times into a large bowl. Make a well in the center of sifted dry ingredients, and whisk egg mixture into the flour mixture. 5). With an electric mixer, beat the egg whites until frothy. Add the cream of tartar and beat until firm peaks form. Fold the beaten egg whites into the flour/egg yolk mixture in two batches using a balloon whisk or rubber spatula. 6). Gently pour the batter into a 9 or 10-inch (23-25 cm) ungreased tube or angel food cake pan. With a spatula, spread batter to even out top. Bake in preheated 350 degrees F (180 C) oven for 45 minutes or until the cake feels spongy to the touch. 7). Remove cake from oven, and carefully invert the pan (upside down) onto a cooling rack. Do not remove cake from pan until completely cooled. Once cake has cooled, run a spatula around the sides and center tube of the pan to release the cake. When you are ready to slice the cake, use a thin sharp knife with serrated blade, and cut with a "sawing" action opposed to slicing through the cake. 8). If desired, dust top of cake with confectioners' sugar, and serve with whipped cream and fresh fruit. 9). Store cake at room temperature (covered with foil or plastic wrap, or cover with a glass cake dome) for up to 3 days. Makes one (9 or 10-inch) chiffon cake. Pandan Extract (also called Pandan Essence or Flavoring) and Pandan Paste may be found at Asian food stores or online at: http://www.zestyfoods.com. These items are listed under their Sweets and Chips section of their website. Coconut Milk can be purchased online at: http://www.asianwok.com, and Pandan Leaves Extract (juice) in a 14 ounce can (400 mL) may also be purchased from AsianWok.com. Ovalette (for stablizing chiffon cake or other sponge type cakes) is difficult to find here in the USA. 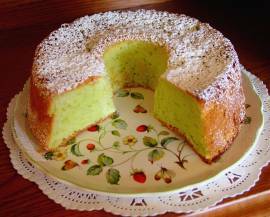 It is not necessary to use ovalette in this recipe for Pandan Chiffon Cake. You may leave it out if you can't find it. It won't make a big difference. Have been looking for the "right" pandan chiffon recipe, this is the easiest and best I've tried! The cake tastes good, the texture is so light and fluffy (almost velvety)...even without using the Ovalette (which I have yet to find in Canada). Thanks! Fell in love with Pandan cake in malaysia, though i haven't been able to find the Coconut cream filling they use there. There Pandan Cakes are cut in half and then a thick Pandan Coconut cream mix is sandwhiched between the two halves. Would anyone know of the recipe for this filling?. THIS ROCKS! I LOVE THIS CHIFFON CAKE! ~ Thanks so much ! Hi Diana, now I can make the pandan cake by myself. This is my favorite cake. When I'm in my country it is easy to buy, but because i'm in another country it is very hard to get it. I also put this recipe at the allrecipes.com, so all people can try it !!!! I am wondering whether I can use durian instead of pandan and if i can how do i do it and whether it will affect the smooth texture of the cake? Please advice. Thank you, Deana. Have done it so many times. Always a success! I have access to fresh Pandan leaves. How may I use them to replace the extract and paste, and why did the top of my chiffon cake crack? Please Diana, help me on this. Very good. This is the first chiffon cake that I have made in the past years that tastes really so good. It was perfect on the first try. Excellent. This is a die die must try recipe. I am looking for a recipe that uses evaporated milk instead of coconut milk.... healthier baking. Anyone have such a recipe??? What's granulated sugar? Is it confectioner's sugar or castor? Can I use confectioners? Tell me how to seperate eggwhites and yolks without having some yolks on the eggwhites 'cause I always fail in making chiffon cakes. I have made this pandan chiffon and I think it's better if you give the amount of water in the recipe. Good luck! Hi, I have been looking for Pandan powder for years to make a chiffon cake with it. Who can I buy it from? Is it possible to buy it online? Please let me know. I live in Annapolis, MD, in the USA. Been trying so many times, the cake is fluffy and tasty but why the top is kind of not smooth but cracked thus making the cake's shape lopsided, please advise asap. Thks. i give to my friend to taste it they say it is good. The cake is very fluffy and soft, but I do think it's lacking in the pandan fragrance. I will try to use some pandan leaves next time. Hi Lance, It would have been better to have left out the lime juice when trying to substitute for the cream of tartar. There really is no good substitute for cream of tartar. No, using powdered sugar is not a good idea. The recipe calls for granulated sugar and that is what works best. Good luck when you try again. PS. I am told that cream of tartar can be purchased at pharmacies in some countries in Europe. Cream of tartar is the white residue which is left over after grapes are used for making wine. I don't know what cream of tartar is called in French, so ask your pharmacist. Hello Diana, tried the recipe. Despite baking for more than an hour, parts of the inside appeared to be damp (slightly oily to the touch). Inside is not as light/airy as I expected as well. What do you think could be the problem? Do you think it is better if I use cake flour and add baking powder/salt myself, instead of self-rising flour? When beating egg whites, how to tell if firm peaks are formed? Caster sugar is same as granulated sugar right? When adding 1/2 tsp of Cream of Tartar, is it a flat tsp or heaped tsp? But overall, taste is there. Smells good too. Rather easy recipe and good instructions. Thanks for the recipe. If i want to add pandan leaves for flavoring in the recipe, what should i do and by the way i don't like the green food flavoring because it makes me feel the cake is unhealthy. Hello, thanks for your recipe. It tastes really good, but the shape of the cake isnt ideal. Probably, I cant get cream of Tartar in France and replaced limejuice instead. Do you have any suggestions? Besides, for granulated sugar, I have used normal powder suger, is it ok? i used an electric mixer to beat the egg white for about 20 minutes.., and it only half-peaked..,why is that? love this cake, it is so delicious! Great recipe, very yummy cake! Any tips on why the bottom half of the cake flopped after coming out of oven? been looking for this recipe. i was born in Singapore and now living in the States, it's hard to find good bakery. Great recipe. I made it right the first time - a miracle! I like the cake, but the top of the cake cracked and the cake dropped. I used self-rising flour. I have Pandan leaves, but can I use Pandan leave instead of Pandan extract? Please help me. Thanks. It tastes very good, light and fluffy!!! All my friends love it so much!!! I definitely will make it again. I don't have an angel tube tin, is this why the cake always collapses after coming out nice and tall? I used a normal 9 inch cake tin. Also, could you advise me if this sort of tin will work for the chiffon cake? this pandan cake tastes so good so light that my family is addicted to it! but do you have a way to keep it less oily to the touch? Hello there, Just wondering if you could help. I've tried baking this cake several times now and the taste is excellent however whenever I take it out of the oven it shrinks to half its size once cooled, I'm using self raising flour which in the recipe says its ok to use. Secondly, I have this problem where once the cake is cooled, there seems to be a very soggy texture at the bottom, my guess is that it is the oil, I made sure I have thoroughly mixed in all ingredients, therefore my question is would is be possible to leave the oil out of the recipe? I have tried minimizing the amount of oil stated and it still has that soggy texture. Please let me know what to do to make this cake better, many thanks! Thanks for sharing the recipe. It tastes really great, but i have a problem with inverting the cake. Why did the cake came off from the cake pan when i inverted it? This is the best recipe so far. Just loved the texture of the cake. I would like to bake an Orange Chiffon Cake, do I substitute the same amount of coconut milk with the orange juice? Diana, I've been making this cake for a while, each time very yummy and fluffy. But sometimes, the sides cave in, can you please tell me why? Thank you very much. I have not yet made the cake but I like the recipe. I wanted to give some help out to the reviewers who had issues with cake cracking or falling off or soggy bottoms. First of all for the reviewers who had a cracked top of cake, soggy bottoms or collapsed cake when taken out of oven - your oven could be too hot, make sure you have an oven thermometer in your oven all the time, they cost about $4 in the grocery to purchase and is a valuable kitchen tool to have. Second for the soggy bottoms as well as cake falling out of the pan, over mixing or undermixing could be the problem here. The recipe says to blend the liquid ingredients until well combined, according to a chiffon cake technique I think you need to blend it until it is light in colour and that when your beaters lifted form a soft ribbon. Then comes the egg whites portion - always use a metal spoon in folding batter/egg white mixture as it (a) ensures there is no grease on the utensil (b) "cuts" into the air pockets without deflating them as much as possible. Last of all, for those who live in the US - I would stay away from commercial self raising flours. Having grown up in the UK, I found self-raising flours reliable. However, when I came to the US, I found them unstable and produced horrible results and have not used them since. That could also be a contirbutor to a collapsing cake once removed from oven. I always use Swans Down Cake flour even in my brownies, and put the baking powder and cream of tartar in to help the cake rise. I hope I've been of help, would love to hear your feedback! Thanks. Thanks for sharing this recipe. It's delicious. This is the first time I made a Pandan Chiffon cake. I am not the type who usually writes reviews. But this recipe is the best. It's so good. I used real pandan juice instead of pandan extract and it came out great. Everyone who tries it loves it. My cake cracked so much that it looked like a volcano! I put the oven to 140 but it took over and hour to bake. Please help! I've tried your recipe and am glad it turned out well. However I have one question. Why doesn't my cake stick to the pan when its inverted? It falls onto the cooling rack whenever I invert it but I've used a satay stick to test it out and its thoroughly cooked. Why is that? Please help! I am going to buy fresh coconut and pandan leaf first then i can start to make ... wish me good luck. This is my first attempt in trying the chiffon cake and the cake turned out as how we would buy in the store. My cake is so fluffy and moist. Thanks Diana for the wonderful recipe. I would also like to try out the orange chiffon, do I add the juice same amount as the coconut milk? This is wonderful! I'm glad i have Vietnamese mother, otherwise i would have a tough time finding these things. It was so PERFECT!!!!! The only thing i didn't use was the pandan paste because i didn't have it, but it tasted exactly the same as the ones i would buy at the store! oh! forgot! i also added 2 teaspoons of vanilla and used the muffin pans instead, it only took about 10-15 minutes and they were done! Light and fluffy and oh so good! My mother loved it! Thank you so much! Look forward to looking through your other recipes. I've tried other recipes for pandan chiffon cake, and every one of them failed except for yours! Your recipe was a success just like the shops! Thank you so much. It's been popular with my family and friends. Tried this and worked the first time! Thanks so much! The only thing was that I didn't realize there would be so much batter and my cake tin (no tube) was nearly overflowing! Which made the cake rise v high in the oven and brown quickly and had big cracks. So when I finished baking the cake rose above the tin and I couldn't invert the cake on a cooling rack! Despite that, after I cut off the 'dome' part that was a bit burnt the sponge inside was wonderfully soft and fluffy! Do we need to use that many eggs? Or can we reduce amount of eggs so there isn't so much batter? I baked this cake today. It came out perfect. Thank you for sharing your recipe.